Well, you are here because you read about Cataract surgery , or somebody you know is affected by it. As we all know, Cataract is the clouding of the lens present inside the eye due to accumulation of protien and some other compounds. Due to this condition, the patient experiences vision loss eventually. However, it can be corrected using dark sunglasses glasses, artificial lenses and corneal surgery. By the year 2015, around 60 million people in the world were affected by cataract. Mostly, Cataract treatment involves removing the cloudy lens from your eye and replacing it with an artificial lens also known as Intraocular lens or IOL. This helps in restoring the patient’s natural vision. In many cataract surgeries, a high-frequency ultrasound device is used to break up the cloudy lens into small pieces. Suction is then used to remove the broken residue and you are left with a cataract free eye. As scary as this condition may sound, cataract is curable and has a solution for most of the problems suffered by the patients. If you are suffering from this condition or anyone you know is suffering from one, reading this blog might help you shed your inhibitions about getting an absolutely safe and simple surgery for its treatment. 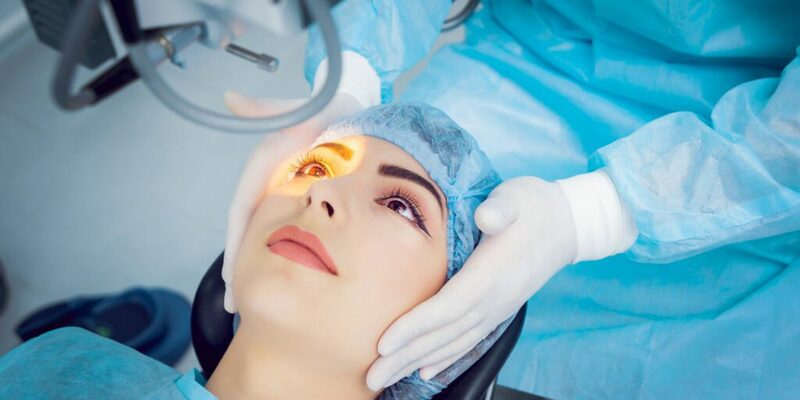 Femtosecond laser technology has replaced hand-held surgical tools when it comes to corneal incision, anterior capsulotomy, lens, and cataract fragmentation. This advanced cataract surgery is an extremely safe and an accurate procedure. The use of laser ensures precision which ultimately reduces risk. So, your problem is solved. If you were worried that things might go wrong – don’t worry, we’ve got you covered! A better and a more predictable vision outcome is achieved through Laser cataract surgery. And the good news is that the cornea doesn’t swell post the cataract treatment. It means that the recovery time for the patient is reduced drastically. This happens due to the reduced usage of energy as compared to ultrasound to break up the cataract residue. Microincision cataract surgery involves creating an incision of 1.8 mm which reduces surgical invasiveness. The major benefit of this method is the control over errors and avoidance of surgically induced corneal astigmatism. The long-term stability of the result by MICS has earned it the title of the most modern approach and the least invasive cataract surgery. Any workaholics in the house? Well if you think that getting cataract surgery is a time-consuming process and would disrupt your daily life – Then think again! Phacoemulsification is a process where 2.5 mm to 2.8 mm opening is required to remove the cataract. Due to this process, there is no need for stitches. And you will heal in a jiffy due to minimum invasion. This cataract surgery won’t be a burden on you as you can resume your normal life from the very next day. Want to treat your cataract immediately but don’t want to be hospitalized? Well, then Phacoemulsification is for you. This cataract treatment doesn’t require the patient to be hospitalized. No bandages are required as there are smaller incisions and fast recovery of vision is expected. As the number of people suffering from Cataract is increasing, cataract treatments are making an advancement too. If you want to get cataract surgery done then go ahead confidently. Maxivision Super Speciality hospitals will provide you a safe and advanced cataract surgery so that you enjoy a clear vision.